#TSPSC Gurukulam JLs /Residential Junior College Lecturers Recruitment 2017 answer keys, results, selection list, interview dates, final selection list @tspsc.gov.in. TS Gurukulam jobs notification 2017, TSPSC GurukJunior Lecturer Posts Recruitment Notification No: 27/2017 Released on 02-06-2017. Government of Telangana has decided to Direct Recruit the vacancy position in all Residential Educational Institutions Societies through TSPSC. TSPSC released the post Junior Lecturers Recruitment 2017 for filling up the Gurukulams JL posts/ Gurukulam Junior Lecturers posts under various Residential Educational Institutions (social welfare, TREIS, BC welfare, Tribal welfare, Minority welfare residential ) in Telangana State. Online applications are invited from the eligible and interested candidates through Online mode at TSPSC Website. Telangana Gurukulam JLs/TSPSC Junior College Lecturers Recruitment Online application form, Last date for apply, JLs Exam date, Hall tickets, Results, Certificates verification, Eligibility Criteria, Exam pattern, Syllabus, application fee , Hall tickets, Results, exam Answer key, Preliminary key, Final Key, TSPSC Junior College Lecturers Recruitment Preliminary Exam date, Main Exam Date, Recruitment Syllabus, answer keys, results, Mains selection list, interview dates, final selection list and more details are available here. Telangana State Public Service Commission( TSPSC) has released the Teachers,Non teaching posts Recruitment 2017 Notification No.27/2017 on 06/02/2017 for filling up the Gurukulams various posts/ Gurukulam Teacher posts under various Residential Educational Institutions Societies (TSWREIS, TREIS, MJPTBCWREIS, TTWREIS, TMREIS) in Telangana State. Online applications are invited from the eligible and interested candidates for the recruitment of Gurukulam Posts in Telangana Residential Educational Institutions Societies through Online mode. Application to be made available on Commission’s WEBSITE (www.tspsc.gov.in) to the post of Junior Lecturers in Residential Educational Institutions Societies. The question paper of Preliminary (Screening Test) and Main examination will be supplied in English version only except languages. TSPSC has conducted Combined Screening Test for the Telugu Subject of above notifications on 25/09/2017 FN. DEGREE LECTURERS, JUNIOR LECTURERS IN SCHOOLS AND COLLEGES UNDER REIS VIDE NOTIFICATION NOS.22/2017 & 27/2017 TSPSC has conducted Combined Screening Test for the Telugu Subject of above notifications on 25/09/2017 FN. The Preliminary Key of this exam will be available on TSPSC website from 26/09/2017. The objections on the Preliminary Keys will be accepted online on TSPSC website from 27/09/2017 to 02/10/2017. Candidates are advised to note the above dates and submit their objections through the link provided. Objections received beyond 02/10/2017 will not be considered at any cost. The candidates are instructed to submit their objections only in English and only as per the order of questions appearing on the screen with the question numbers allotted by TSPSC. Min. Max. Scale of PayRs. Only qualified candidates for primary selection round is sent only in the successive rounds of selection. The final selection of the post will be based on marks secured in the main examination either online or omr based and interview / demonstration / viva-voce marks put together. Minimum 18 years & Maximum 44* years. The age is reckoned as on 01/07/2017 (Rule- 12(1)(a)(v) of State and Subordinate Service Rules). Minimum Age (18 years): A Candidate should not be born after 01/07/1999. Maximum Age (44 years): A candidate should not be born before 02/07/1973. Applicants must possess the qualifications from a recognized University/ Institution as detailed below or equivalent thereto as specified in the relevant Bye Laws/ Service Regulations, indented by the Residential Educational Institutions Societies as on the Date of Notification. 1 Junior Lecturers Mahatama Jothiba Phule Telangana Backward Classes Welfare Residential Educational Institutions Society. Academic Qualifications A post Graduate Degree in the subject concerned (or its equivalent) (Annexure-A) with at least 50% marks in aggregate from a University recognized by the UGC. Incase of SC/ST/BC/ Differently abled candidates, the minimum marks shall be 45%. And Bachelor of Education (B.Ed) or BA. B.Ed/B.Sc., B.Ed., from any institution recognized by NCTE with the subject concerned as a Methodology subject. Grants Commission, Distance Education Council (DEC), All India Council for Technical Education and with Jurisdiction to operate such courses ;in the State of Telangana/Andhra Pradesh as case may be. Unless such Degrees have been recognized by the relevant statutory Authority, they will not be accepted for purpose of Educational Qualification. The onus of proof of recognition by the relevant Statutory Authority that their Degrees/Universities have been recognised rests with the Candidates. 02 Junior Lecturer in Sanskrit M.A. in Sanskrit OR Vidya Praveen (Sanskrit) of Andhra University OR Siromani (Sanskrit) of S.V. University OR B.O.L Degree with Sanskrit. Note: Candidates with specialisation like Sahithya, Vyakarana, Nyaya Mimamsa and Vedanths etc in the above titles and Degree are eligible for appointment as J.Ls in Sanskrit. Note: Proficiency course in Sanskrit of CIEFL is not equivalent to M.A. Sanskrit. 05 Junior Lecturer in Physics M.Sc. in Physics/ Applied Physics/ Electronics/ Applied Electronics of Osmania University / Nuclear Physics of Andhra University/ Meteorology and Oceanography / Engineering Physics and Instrumentation of Osmania University / M.Sc. (Tech) Co-Physics Note: Provided these candidates should have studied the subject Physics at B.Sc. level. M.Sc. (Technology) Engineering Physics with any specialisation/ M.Sc. (Tech) Instrumentation/ Any Physics based on M.Sc. Course/M.Sc. (Engineering Physics with instrumentation) of Kakathiya University/ M.Sc. (Technical Engineering Physics) of S.V. University / M.Sc. Astro Physics of Osmania University. 07 Junior Lecturer in Botany M.Sc. in Bio Science of Andhra University/Bioloical Sciences of Osmania University/Plant Science of Krishnadevaraya and Osmania University/ Environmental Biology of Nagarjuna University/ Modern Biology of Maratwada University/ Experimental Biology of Saurashtra University/Bio Technology/ Life Sciences of Indore University/ Marine Biology of Andhra University/ Botany/ Micro-Biology Note: Provided these candidates should have studied Botany subject at their graduation level. M.Sc. Life Sciences of Berhampur University provided that the candidates opted for plant sciences in 2nd year/ M.Sc. Plant Science of University of Hyderabad. 10 Junior Lecturer in Commerce M.Com. in Commerce/M.F.A. (Master of Financial Analysis) renamed as M.Com (Financial Accounting) of Kakathiya University having B.Com at graduation level should alone be considered. 12 Junior Lecturer in History M.A. in History/Ancient History and Archaeology Note: Provided these candidates should have studies History as one of the subjects of B.A. Degree level. M.A. Indian Culture of S.V. University/M.A. History, Archaeology and culture of Dravidian University/M.A. Ancient Indian History and Archaeology of S.V. University/M.A. History, Archaeology of Andhra University. The Applicants are requested to refer the TSPSC TS Residential PGTs Recruitment Syllabus, Exam Pattern/Scheme of Examination from the below given link. 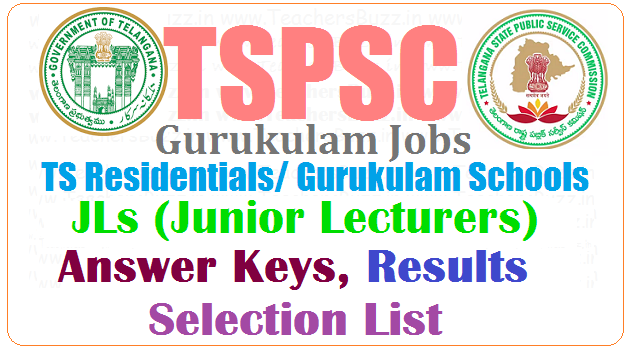 Search Tags: TSPSC Gurukulam/Residential Junior College Lecturers Recruitment 2017 applications @tspsc.gov.in, Gurukulam jl posts, ts residential jobs, gurukula schools,TS Gurukulam Posts, Residentials Teaching Non Teaching Posts Notification Syllabus 2017, TSPSC Gurukul Teacher Recruitment 2017, zonal wise, category wise,zone5,zone6, reservation wise, general,women,sc,st,bc, oc,vh,oh,hh, agency,plain, subject wise vacancies, boys institutions, girls institutions, tswreis, tsreis, mjp tsbcwreis, tstwreis, tsmwreis gurukulams residential schools jl/ junior lecturer posts Eligibility, Apply oninefor Telangana Gurukul jobs tspsc.gov.in TSPSC #Residential Junior College #Lecturers Recruitment Online application form, Eligibility criteria, Hall tickets, Results, exam Answer key, Preliminary key, Final Key, TSPSC Junior College Lecturers Recruitment Preliminary Exam date, Main Exam Date, Exam pattern, Syllabus and more details available on TSPSC Web portal.